The Duke and Duchess of Cambridge are loved globally, and even by the editor of Vanity Fair magazine! Vanity fair planned to feature popstar and actor, Justin Timberlake on their July cover. Instead they opted for a beautiful candid of William and Kate taken by Mario Testino as part of their official engagement shoot, though Justin Timberlake's feature still appears inside. A source close to Justin said: 'He is very happy with Vanessa's story and Mr. Roy's photos.' 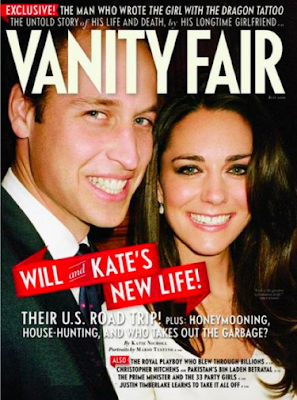 Their siblings Prince Harry and Pippa have also been gracing numerous covers in the states. William and Kate's popularity is felt everywhere. We have all been touched by their beautiful wedding and fairytale story. They are as good looking as any Hollywood couple and Kate's style is amazing.